As a standard, Finned Cast-In Band Heaters are manufactured in aluminum alloys because this material provides very good thermal conductive properties. For applications requiring higher operating temperatures and/or higher watt densities, bronze or brass alloys can be used. Precision machining of the inside diameter yields superior heat transfer between the heater and the machine barrel, thereby ensuring uniform heating and cooling of the extrusion process. The heaters are secured to the barrel either by Stainless Steel Clamp Bands or by means of Bolt Clamping the heater halves together. Finned Cast-In Band Heaters can be designed to meet the mechanical and physical constraints of existing extruder shroud systems. They are manufactured for Original Equipment Manufacturers (OEM) and maintenance (MRO) applications to customer specifications. The liquid cooling function of the Cast-In Heater is of primary importance in maintaining the proper temperature of the barrel in the extrusion process. Star Electric offers many different liquid cooling variations, styles and terminations. 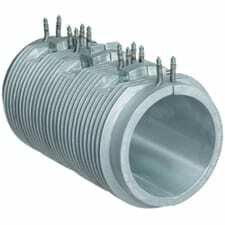 The “L” Shaped Cast-In Heaters are typically used on square and rectangular twin screw extruder barrels in compounding and plastic resin manufacturing applications. Due to high shear rates, which are common in this process, extreme operating temperatures and high watt densities are frequently encountered. For these reasons “L” shaped heaters are manufactured in bronze or brass alloys, which are capable of withstanding high temperatures at higher watt densities. In the case of applications requiring lower temperatures and lower watt densities, aluminum alloys can be used. Aluminum castings are desirable as they have greater thermal conductivity and weigh substantially less than their bronze or brass counterparts, allowing for greater ease of installation. For mounting purposes, the heaters can be designed with 45° flanged ear extensions that are bolted and drawn together, or can be made with through holes machined into the casting body to bolt directly onto the barrel itself. 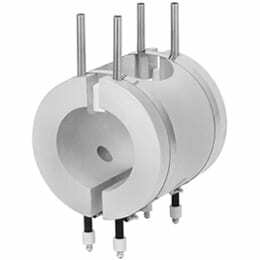 Thermocouple and transducer holes or other special features can be accommodated as well. To enhance the cooling capabilities, or to be used in place of integral feed screw cooling, “L” shaped heaters can be manufactured with cast-in cooling tubes to satisfy liquid cooling requirements. This feature allows processors the ease of changing a single unit at a time, thus representing a far less time-consuming and less expensive alternative should a cooling line become clogged or severely restricted. 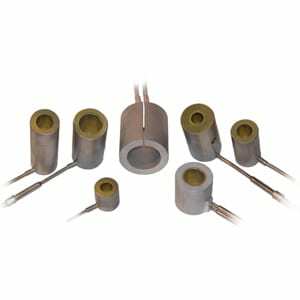 Typically used in compounding, resin manufacturing, and high performance material applications that generate a high shear temperature, these heaters are most commonly manufactured from a bronze alloy to withstand these higher temperatures and high watt densities. 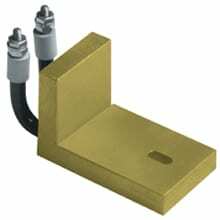 Cast-In Platen Heaters are generally manufactured in aluminum but can also be made in bronze or brass alloys to meet higher temperature processing requirements. For high volume requirements, the permanent mold process can be used to achieve the most effective economies of scale as well as yielding the best cosmetic appeal. 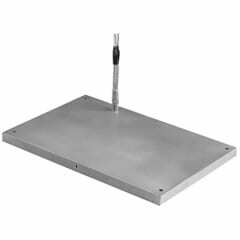 Cast-In Platen Heaters are a versatile cast-in design that can be adapted to a wide varaitey of applications. Typical uses are heat transfer presses, foodservice equipment, die heaters, packaging equipment, and commercial pre-heaters. Tempco Cast bronze nozzle heater bushings offer the latest in state-of-the-art technology to these innovative designs. They eliminate uneven temperature profiles and short heater life; their precision machining also eliminates poor fit and the need for clamping bands, while providing maximum heat transfer. The casting is protected by a stainless steel tube. The maximum operating temperature for the bronze casting is 1200°F (650°C); the optional aluminum casting has a maximum operating temperature of 600°F (315°C). The built-in thermocouple in either Type J or K gives exceptional temperature control when connected to a Tempco TEC controller. The thermocouple has a standard an ungrounded junction located in the center of the width, which helps eliminate stray EMF’s caused by the heater. A grounded junction at the end is optional. The heater and thermocouple have a standard termination of 36- inch fiberglass leads with a stainless steel overbraid. Options include Teflon® insulated leads and armor cable. The Durex Hollow Cast nozzle heater design was developed by Durex to provide a maximum efficiency heating device for plastic molders. Utilizing casting technology, a high performance mineral insulated heater is cast-in a bronze or aluminum alloy and machined for a precision fit onto the injection nozzle.